MILWAUKEE (AP) — Markus Howard is quite the big shot at No. 24 Marquette. He can rebound. He can find open teammates. He can draw extra attention from defenses simply by just being on the floor. And when he gets going at the 3-point line, the Golden Eagles can be tough to beat. The junior sharpshooter is a big reason why Marquette returned to the Top 25 this week. 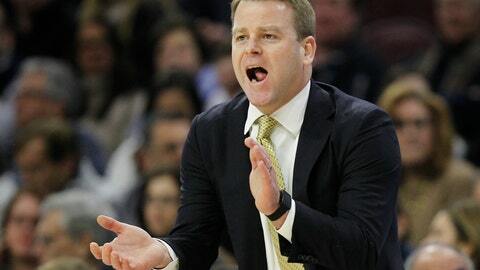 It is the school’s first appearance in the poll since 2013, and the first time in Steve Wojciechowski’s five-year tenure as head coach. Howard was 10 of 16 from the field, including 7 of 10 from 3-point range, for 37 points in 28 minutes in a 92-59 win over Bethune-Cookman on Saturday. That outing erased the memory of a subpar season opener, when Howard was 5 of 16 from the field, and just 2 of 12 from the 3-point line in a victory over UMBC . Howard finished with 15 points. Howard proved his marksmanship from the arc as a freshman, when he led the nation by shooting 54.7 percent, which was also a Marquette single-season record. He shot 40.4 percent from the 3-point line as a sophomore. The accuracy is the result, in part, of hours of offseason workouts back home in Arizona. Good plan considering how much deeper that Marquette’s roster seems to be this season. Joey Hauser and Brendan Bailey give added length and athleticism up front as freshmen. Joey Hauser’s older brother, Sam, is a steady, do-everything forward who provides leadership. Sacar Anim and Jamal Cain provide athleticism on the wing. Emerging sophomore Theo John can muscle up in the paint. Added depth has helped Marquette play better defense, too, after holding the first two opponents to a combined 26 percent shooting. Marquette was 326th out of 351 Division I schools last year in allowing opponents to shoot 47.8 percent. If the Golden Eagles can play anything close to the level of defense that they’ve played over the first week through the course of the season, they should return to the NCAA Tournament for the second time in three years. Several key pieces on the team, including Howard and Sam Hauser, were on the team two years ago that lost in the first round of the NCAAs. They also have the experience of advancing to the NIT quarterfinals last year . More often than not, Howard is still one of those players. He took Big East Player of the Week honors for averaging 26.0 points, 8.0 rebounds and 6.0 assists over the first two games. He has scored 30 points eight times in his career, the most for any Marquette player since 1963-64. The Golden Eagles might need another all-around effort from Howard to pull out a win in a tough road game at Indiana on Wednesday.